The NEXYGENPlus is the hub of the Lloyd Instruments materials testing systems. 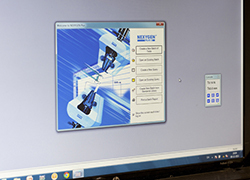 With the NEXYGENPlus software as part of the materials testing system, the user can simply select from the extensive library of pre-defined test setups based on international standards or create an advanced multi-stage test, all using the same program. This extraordinary flexible and easy-to-use materials testing software allows the operator to control and monitor all aspects of the system from a single front end, ensuring fast, reliable and powerful testing and data analysis for a variety of test types such as tensile, compression, peeling, tearing, creep, relaxation and flexural tests. Getting started with the NEXYGENPlus materials testing software could not be simpler, thanks to the extensive built-in library of test methods, all in adherence to AACC, ASTM, DIN, EN, ISO and other international standards. You can also choose to create custom multi-stage tests for more complex or unique test demands. Entire tests can be videoed and synchronised with the stress/strain data and replayed for detailed post-test analysis. A powerful security and audit trail module provides 100% traceability and the software provides full automation capacity for automatic testing. The NEXYGENPlus software interacts with Excel and Word, offering you the possibility of automatically transferring your test results directly into your own corporate templates. A simple-to-use report designer is linked to Excel and Word, enabling all layout, fonts and images to be manipulated in the full power of these programs. Nexygen Plus Software Version 4.0.1 28-Mar-18. Fixed Cohesiveness test result error. Nexygen Plus Software Version 4.0.0 11-Oct-17. New Features: 1) Added support for the LD Series. Fixed: 1) Addressed the "Run-time error 7" message when editing results, 2) Archive now happens once a day, 3) Improved the break extension result when also reporting the break load result, 4) Improved memory management when running for a long duration.